Prop Gordon Reid believes Scotland have the physicality to overcome Samoa and secure progress to the Rugby World Cup quarter-finals. Victory for the Scots would send them through to the last eight of the tournament for the first time since 2007. Reid expects the Samoans to "come out with all guns blazing". And he added: "Everyone is saying it's a nothing match for them but they will be determined to finish on a high." 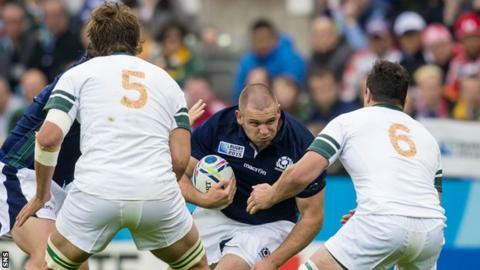 Vern Cotter's Scotland claimed bonus-point wins over Japan and USA before losing 34-16 to South Africa on Saturday. And the Springboks made sure of their quarter-final place with a 10-try win over USA. If Scotland slip up against Samoa, Japan can take advantage when they meet the Americans on Sunday. Samoa have one win from three games in Pool B. "They have a big physical pack who play straight rugby pretty similar to South Africa, so hopefully we will wear them down and our physicality will come through and get us the win," said Reid. "The South Africa game was a very physical one and it was a good settler for the boys in terms of getting us in good stead for Samoa. "But there are a lot of areas we have to look at, and we have to make sure we learn from last week and do some things differently to make sure they go right. "We know it is not going to be easy. They are big and physical and they have beaten us before but we will be fresh coming into the weekend and we will be ready."